April 10 was an action-packed day for Filipinos not only because of the Pacman-Bradley fight in Las Vegas but also because of the one and only vice- presidential debate held at the University of Santo Tomas. 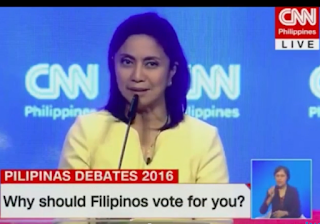 Like Manny Pacquiao who dominated his supposedly final fight against Bradley, Congresswoman Leni Robredo also dominated social media as well as online polls by traditional media during the vice presidential debate. Robredo topped the online poll by Rappler, where she got 41.58% of the total 582 votes. Allan Peter Cayetano came in second garnering 36.25% of the votes, while Ferdinand Marcos Jr. was a far third placer with 18.21% of the votes. In the poll posted by Inquirer on its website and Facebook pages, Robredo also grabbed the top spot, as readers were asked "Who's winning the vice presidential debate?" Leni got 42.58% of the 10595 votes, followed by Chiz Escudero with 25.45%, and Cayetano with 18.46%. SWS poll leader Bongbong Marcos only came in fourth with 12.02%. In the Facebook poll by Inquirer, Cayetano led with 44% of the total 14,287 votes, followed by Marcos who got 28% and by Robredo with 23%. Escudero only got 3%, while Antonio Trillanes and Gregorio Honasan only got one per cent each. On Twitter, Robredo was the most mentioned vice presidentiable, with her name mentioned in 51% of the tweets from 12 midnight to 12 noon on April 10. She was followed by Cayetano with 27%, Marcos with 18% and Escudero at 3%. Honasan and Trillanes were only mentioned in 1% of the tweets. 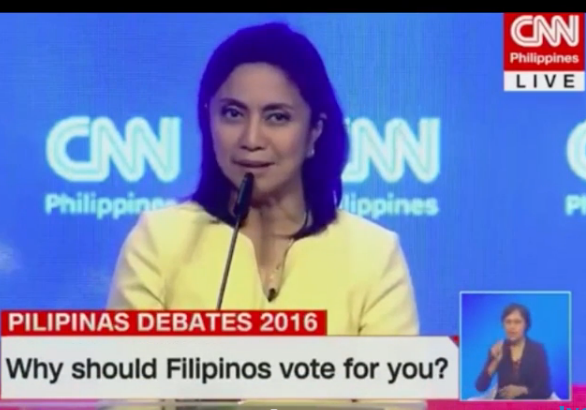 The words "Leni For VP" also became one of Twitter's top trending topics in the Philippines prior to the debate. The polls may not have been conducted in a scientific manner but it is clear from the results that the widow of Jesse Robredo made quite an impact during the vice presidential debate. She may not be the darling among Facebook users, which some people observe is Duterte's turf, but Robredo's numbers on Twitter is impressive. Among the vice presidential candidates, it is Robredo's poll numbers which had increased dramatically since last year. From only 2% in the SWS September 2-5 2015 survey, Robredo's numbers now range from 19% to 25%. She has come in third in most poll surveys by SWS and Pulse Asia. In a phone survey by MyPhone titled Halalan 2016 poll, which ran from April 1 to 9, wherein a total of almost 96000 voters responded, Robredo grabbed the top spot with 26% of the votes.Marcos was a far second at 21% while Cayetano came in at third with 19% of the votes. Analysts have noted that there is still no clear winner in the VP race, as in the presidential race. The numbers are still very close if one considers the margin of error which ranges from ±2% to as high as ±5% and the undecided/unknown reponses which also ranges from 2% to 6%. As for Robredo, if her performance in the debate translates into numbers, we just might see a dramatic change in the rankings of candidates in the next vice-presidential survey.